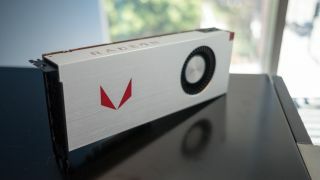 Rumors of new AMD graphics cards are heating up, and we’re a little more convinced that the AMD Radeon RX 590 is real after the first drop of benchmark data has leaked out. A new entry in the 3DMark database shows that the AMD Radeon RX 590 can deliver a TimeSpy score of 5,028. With that sort of score, this rumored Polaris 30 GPU fits between Nvidia GTX 1070 and GTX 1060 levels of performance. What’s more, the benchmark tells us a little more about the card, including its purported maximum clock speed of 1,545MHz – supposedly 205MHz faster than the current AMD Radeon RX 580. The RX 590 will also supposedly feature 8GB of video memory operating at a 2,000MHz memory clock, which may suggest that AMD plans to stick with GDDR5 memory for its new graphics card. Despite similarities to AMD’s latest series of Polaris 20 graphics cards, rumors suggest the AMD Radeon RX 590 will be built upon a new Polaris 30 architecture that introduces a new 12nm fabrication process. Both of AMD’s current graphics card families (Polaris 20 and Vega) utilize a 14nm process, so this might be a stepping-stone towards 7nm Vega GPUs that will be the next stop on AMD's GPU roadmap. If the rumors and benchmark data are real, the AMD Radeon RX 590 might just be the best mid-range graphics cards you can buy this holiday. Especially when Nvidia has yet to announce a Turing-based replacement for the GeForce GTX 1060 much less a sub-$500/£500 RTX graphics card.